Some people use their arms to depict the extent of their love. That's for wimps! 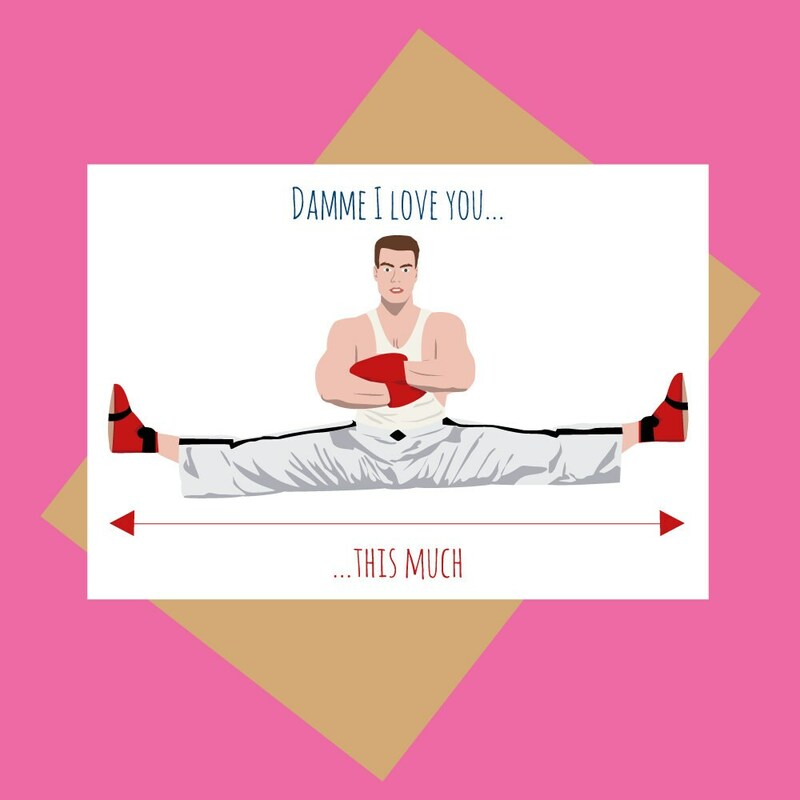 Tell someone how much you love them with the best unit of measurement - Jean Claude Van Damme splits! Original design digital print inspired by No Retreat, No Surrender, using a Macbook Pro and Adobe illustrator. - AUSTRALIAN ORDERS: Please allow 4 - 10 business days. In some cases it may take longer. - INTERNATIONAL ORDERS: For international orders please allow 1-3 weeks for air mail delivery (in rare occasions, international delivery can take longer). - Due to the nature of printing, the colour of your print may differ slightly from what you see on your monitor. - Meet Me In Shermer retains all reproduction and copyrights. This is super important to me and I will always do my best to make sure you’re 100% happy. If, however, for some reason you’re not - please don’t hesitate to contact me. Please note that this product does not have the approval or endorsement of the owner or creator of the character(s) depicted. ‘Meet Me In Shermer’ does not have an association with the owner or creator. This product is an original creation inspired by the source material. The shipping was really fast. I bought this for my husband, who doesn't like cards. He put it on his desk at work. This was a great find and a great buy. Thank you so much. At this time I, unfortunately, can't offer custom products. All cards are packed in a C6 envelope with a boxboard backing to ensure it gets to you safely without bends. I also stamp "do not bend" on the front of the envelope. My cards are most definitely available for wholesale purchase. I am always on the lookout for more stores to stock my range, so if you are interested please don't hesitate to get in touch. You can email me on wholesale@meetmeinshermer.com for more information. I'd love to hear from you! Unfortunately, Australia Post doesn't offer tracking for items shipped via regular mail so I am unable to tell you exactly where your cards are once they have shipped. Orders to the USA, UK and Canada: While orders generally arrive within 7 business days, it can take up to 3 or 4 weeks in rare cases. It is rare, but it can happen. Orders within Australia: Orders generally arrive within 3 or 4 days, though it can take up to 2 weeks in rare cases.